I was walking through the craft aisles with my nephews when I happened to see colored glue sticks. I’m not sure if these are a new thing, or something I just never noticed before, but the second I did see them, I kept thinking of this necklace from Dare to DIY. Now when I first saw the necklace I thought it was genius even if it was not exactly to my taste. But I guess some part of my brain filed it away as an awesome concept to play with later. When I got home I loaded up my hot glue gun with my metallic gold, bronze and silver specialty sticks and soon realized that I was having the most difficult darn time drawing with the hot glue gun. The pressure it takes to push the trigger for an extended period of time was making my hand shake, badly. So drawing anything was totally out of the realm of decent looking ideas for me. I went back to Dare to DIY and thought that the dots were a lovely idea and easy to accomplish. But I didn’t want to rip it off entirely, either. What about swirls? And that’s how my hot glue rings were born. The most important thing here is that if you want to get the glue off in one piece you’ll need to work on surface conducive to that. I pulled out a piece of glass from a picture frame which worked well. You can also use something like a Tulip Craft Mat. I measured a piece of paper around my finger and trimmed it to the length I would need for a ring. 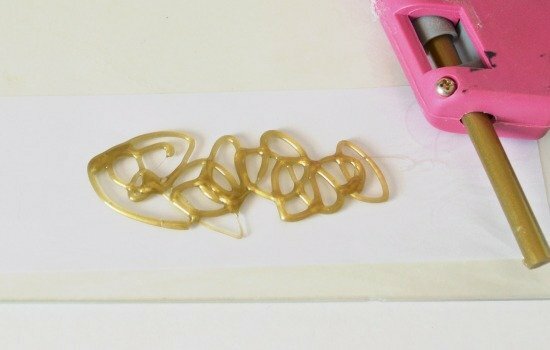 Use your hot glue gun to draw either shapes, dots or swirls the width you’d like and the length you’ll need to wrap around your finger comfortably. Allow the glue to cool completely and then peel off of your glass or mat. Turn over and allow the underside of the glue to dry a bit as well. 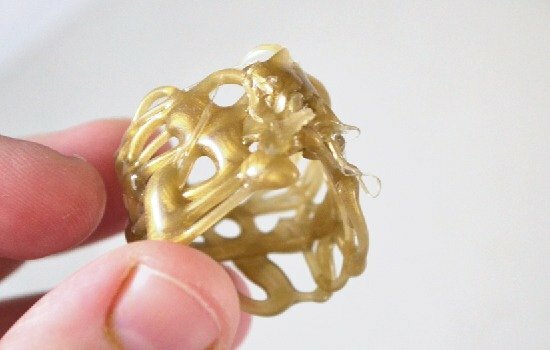 Roll the glue into a ring shape and use a big of hot glue to connect both sides. Don’t go overboard or you’ll have a nasty knot of glue pushing into your finger. And you’d think it would be easy to trim after the fact, but it really isn’t. I found that a razor blade or utility knife blade worked well for trimming my bits if they got too large, or to remove nasty globs of glue. Since this was an imperfect process for me, I wound up using the razor blade a bunch. I also dug out my rhinestone kit and started adding them to my glue to make some rings with bling. One of the things that I learned was that the regular “clear” glue melts the quickest and is the easiest to draw with. It would be more budget friendly to make your shapes with the regular glue and paint to the color you want after. I had the brilliant idea of using rhinestones on clear glue thinking the end result would be kind of clear but it wasn’t as great as I’d hoped. I also played around with the gun very high above the glass to make really thin lines of glue. The look was totally different but there was no way to make the proper shape I wanted either. I wound up making a sheet and then trimming the size and shape I needed for my ring out of it. Some of my rings came out significantly better than others. I’ve actually worn the silver one in the front out and gotten a few compliments on it. Even though the vast majority of my efforts were craft fails, the few that came out really well were totally worth it. I’ll probably experiment with hot glue and jewelry again, but more than likely I’ll keep my expensive colored glue sticks out of the trial and error period. If you’re wondering about the texture of the finished rings, they remind me a lot of the softer jelly sandals from when I was a kid. They’re soft and pliable but you don’t worry about them breaking easily. If you haven’t, yet, be sure to check out the very successful hot glue inspiration for this project at Dare to DIY. So, what do you think – willl you experiment with hot glue jewelry or does it look like a total craft fail? Brilliant. Love it so much that I think I will start my Christmas gift making early. My niece will love these. I'm so glad, Beth! Have fun and you're so smart to be getting on Christmas early. I'm afraid I will always wait until December to start making throw quilts and crocheting scarves! Such a cute idea! I have to try this…and the necklace from Dare to DIY. Both are adorable!! Thanks for the kind words, ladies – and thanks for the pins, Mariel! I love how nice these came out, but I think what I love more is how honest you are about your crafts! They look wonderful, but feel real. I am not the best, nor am I very artistic but after looking around in your page, I've been inspired to do my best and use my failures as stepping stones instead of letting them drag me down! THANK YOU SO MUCH!!! That is probably the sweetest comment I've ever gotten, Lisabell. Thanks so much and I am so glad to hear that you're going to get crafty. Fails and projects that we aren't quite sure about are going to happen along the way, but for the projects that turn out even better than we hoped, it's all worth it! It's great! I have seen some ideas with glue gun and now I really want to try this! Cheap and original jewelry. Love it. Thanks so much, Nikki! I hope you do try it! 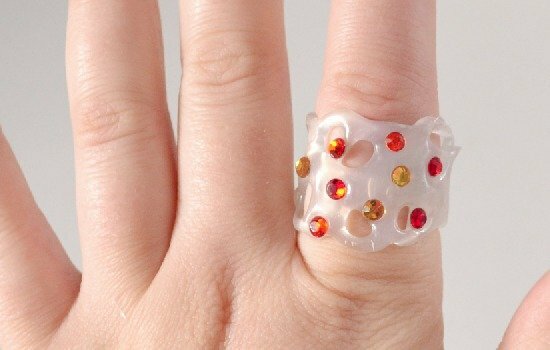 That is such a great idea, I never would of thought to use my hot glue gun to make rings. Genius! Thanks so much, Chelsea – it’s a ton of fun, too :) – be sure to check out Dare to DIYs necklace, as well! I hope your girls have a blast! 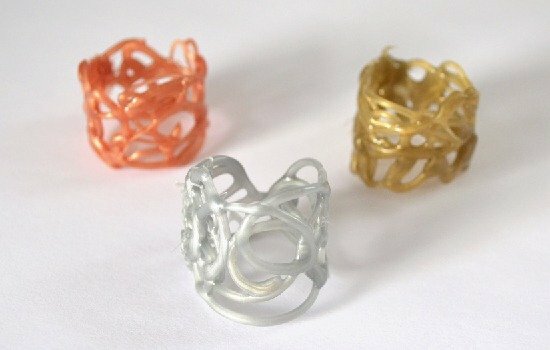 I love these rings, and I love that you further experimented with an experiment, totally DIY pioneer of you. I like all of the rings you featured, but the clear glue with the red rhinestones is completely my favorite, I think its so modernly fancy. I had the idea, in case these become flimsy or easily tear at any point (though I am not assuming that yours did, I was just considering) adding the use of liquid polyurethane. I use it to coat handmade coasters and it dries rock hard and glass-like shiny. I thought the idea of carefully dipping these into the polyurethane and letting it dry would create a glass-like and totally hard texture. Although I cam’t think of how to let it dry, it’s pretty sicky and while easy to work with, it takes a long time to dry. Any ideas what the dipped rings could be set onto while they dry that they would’t stick to? Either way, your take on the glue gun necklace is totally brilliant! Very cute and easy idea. I’ll show it to my niece! 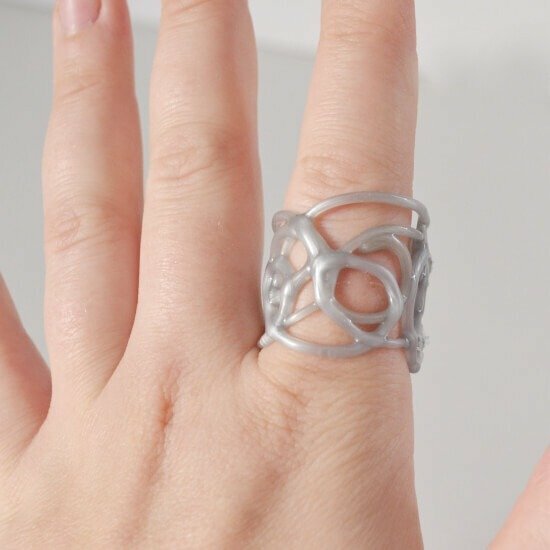 Do you think you could add color paint and swirl it around in the glue and make it like a t-dye looking kind of ring? I thought that would be a cool thing! I think kids would go for something that look that way. But not sure how that would work if you try it let me know. Cool Idea you have! I was looking for hot glued bracelets because I know I saw something similar to this in a bracelet and now I can’t find where I saved it. But it was basically the same as this so thank you. These are really pretty, I think I’ll make some of them too. I found that it was very difficult to peel the hot glue off, however spraying glasses cleaner on the fully dried glob slides it right off with no tearing, even thin pieces! Just in case anyone is having issues with it.